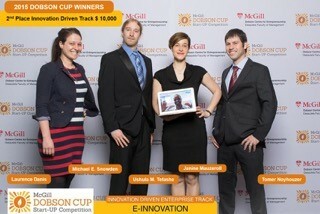 On May 14th 2015, E-Innovation, a team all composed of McGill Chemistry staff and students, was awarded the second place of the 2015 McGill Dobson Cup Start-UP Competition for entrepreneurs in the Innovation Driven Track. The co-founders of E-Innovation are Prof. Janine Mauzeroll, Laurence Danis, Dr. Tomer Noyhouzer, Dr. Michael E. Snowden and Dr. Ushula M. Tefashe. The team would like to thank once again their mentors Marc St-Arnaud, Gregory Kalinin and Pr. Nicolas Moitessier as well as Michèle Beaulieu and Nadia Nour for their generous support and help all the way through the competition. They also want to thank the McGill Dobson Centre for Entrepreneurship for providing such an amazing opportunity for start-up business.